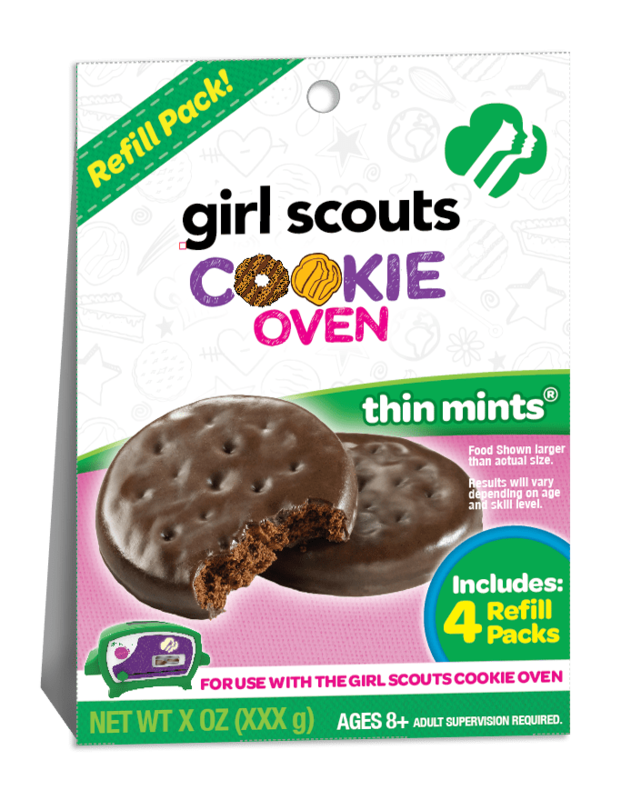 Wicked Cool Toys introduces a delicious baking experience with the first-ever Girl Scouts Cookie Oven™, as well as a line of role play products, inspired by the preeminent girls’ leadership organization in the U.S. 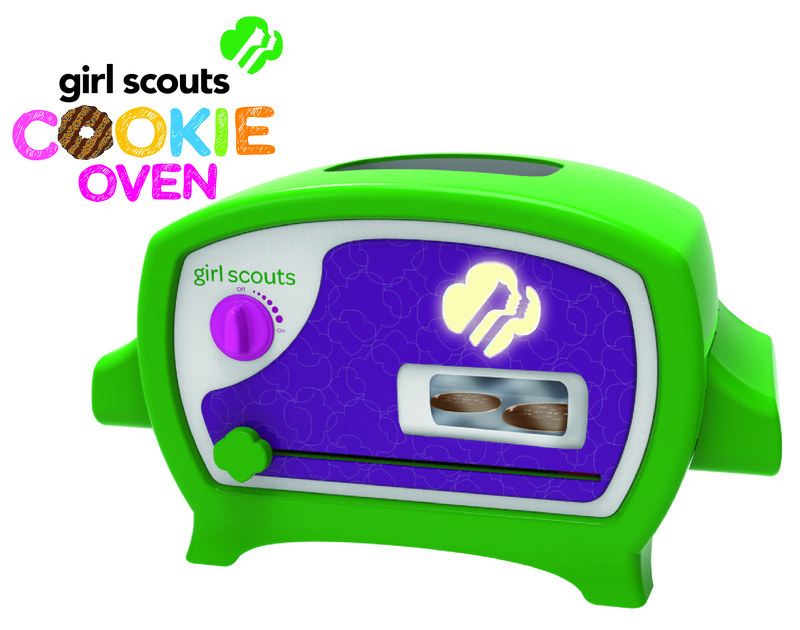 The Girl Scouts Cookie Oven will feature mixes inspired by some of the most popular Girl Scout Cookies®, such as Thin Mints® and Trefoils®, and, along with the Girl Scouts On-the-Go Wagon and Cookie Stand will give girls a chance to express their creativity, learn new skills and experience the fun of Girl Scouts all year long. The Wicked Cool Toys Girl Scouts line is expected to hit mass market retailers throughout the US beginning in Fall 2015. Girl Scouts Cookie Oven – The Girl Scouts Cookie Oven lets aspiring bakers experience the hands-on fun of making their own Girl Scout Cookies. A real working oven, it comes complete with tools and mixes that allow girls to make cookies that look and taste just like the real thing. There’s also a viewing window that lets bakers see the treats they’re making and a warming station to heat and melt delicious cookie coatings and frostings. The Girl Scouts Cookie Oven comes with mix to create Thin Mints®, a spatula, baking pan and measuring tool. SRP is $59.99. 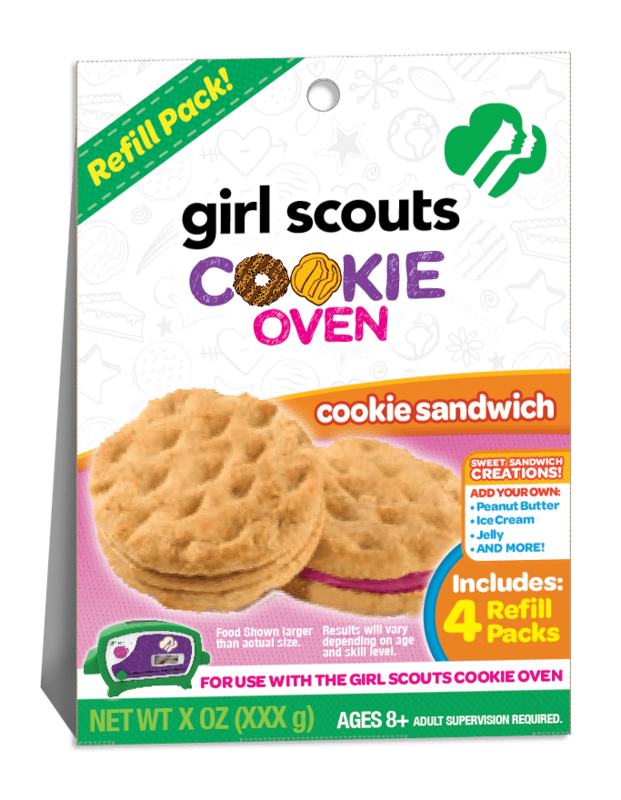 Basic Refill Packs – Popular Girl Scout Cookie flavors as well as classic cookie favorites give young bakers the opportunity to make cookies everyone will love, and include Thin Mints®, PB Sandwich, Trefoils®, Chocolate Peanut Butter, Coconut Caramel, Chocolate Chip, Sugar and Oatmeal. SRP is $6.99. 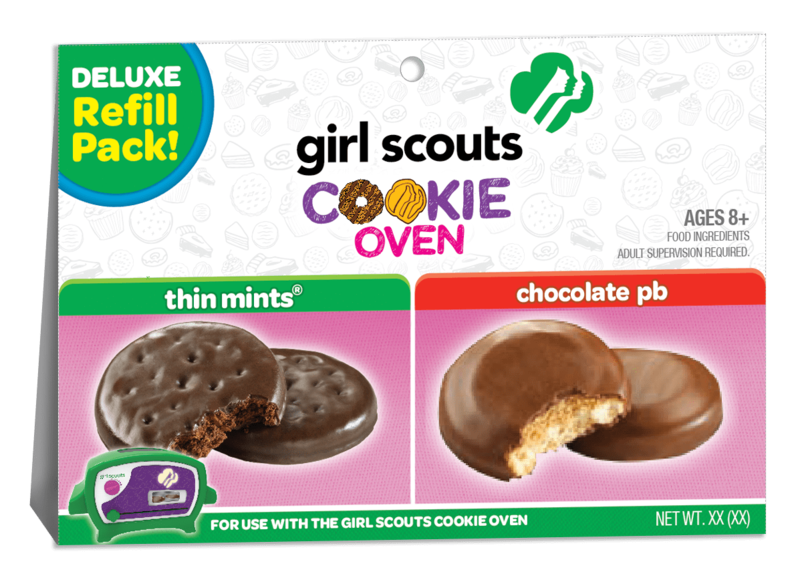 Thin Mints® & PB Sandwich – With two of the most popular Girl Scout Cookie flavors – Thin Mints® and PB Sandwich – the Deluxe Refill Pack includes Thin Mints® mixes, and PB Sandwich mixes to bake these favorites at home. SRP is $14.99. 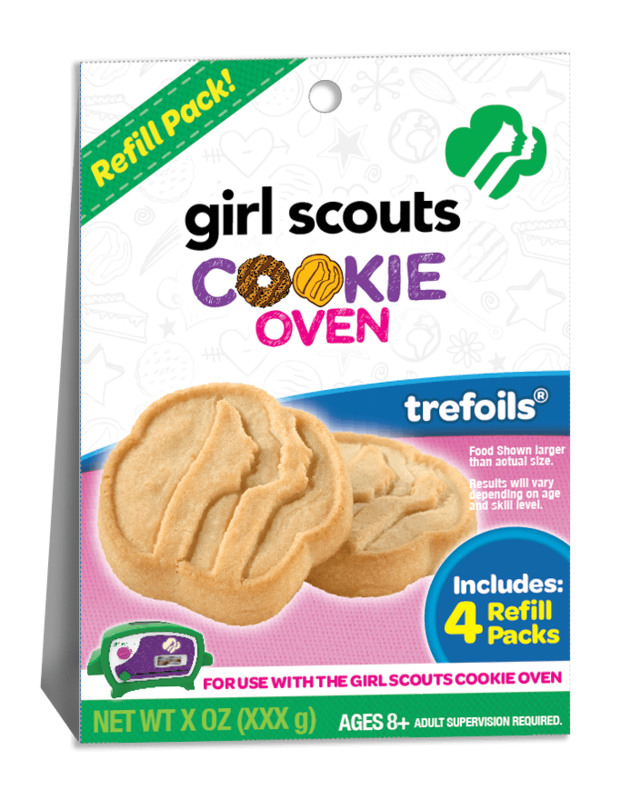 Trefoils® – Three is definitely NOT a crowd in this Deluxe Refill Pack. It includes everything you need to make Trefoils®, Chocolate Shortbread and Lemon Cookies with chocolate and lemon icing. SRP is $14.99. Chocolate Peanut Butter and Coconut Caramel – Recreate two of the most popular Girl Scout Cookie flavors – Chocolate Peanut Butter and Coconut Caramel! 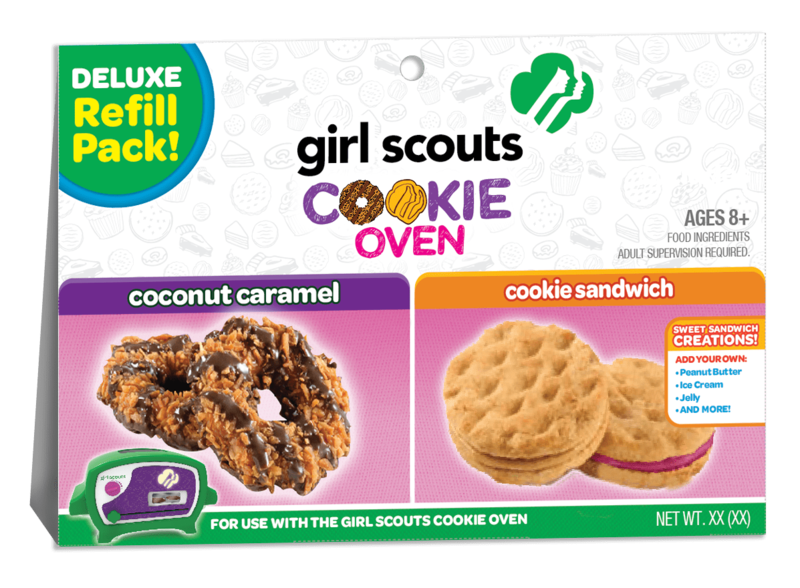 This Deluxe Refill Pack includes everything you need to make these popular Girl Scout Cookies at home. SRP is $14.99. Chocolate Chip, Sugar, Oatmeal – The classics never go out of style and neither do these cookie flavors. Make your own Chocolate Chip, Sugar and Oatmeal Cookies with this Deluxe Refill Pack. SRP is $14.99. 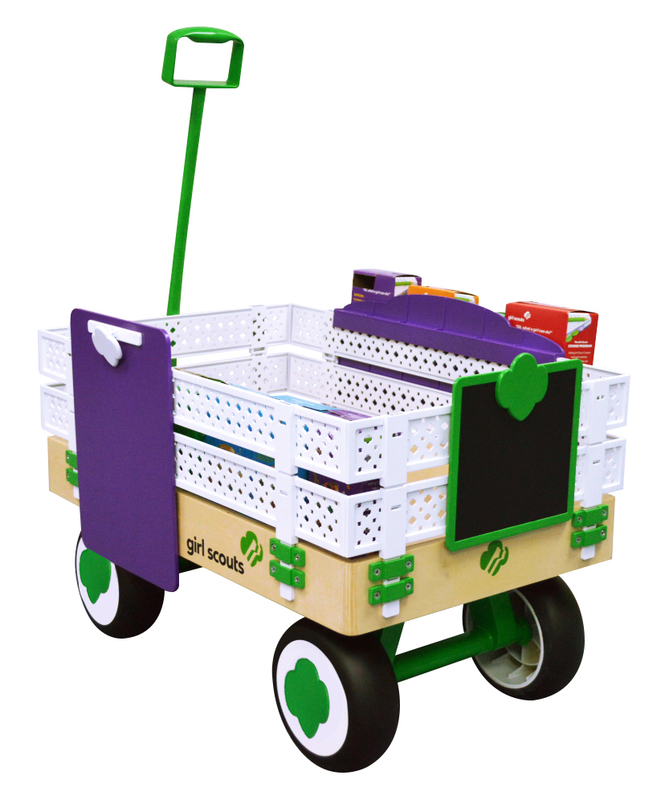 Girl Scouts On-the-Go Wagon –This classic wagon design has a wooden base with height-adjustable metal mesh framed walls with a Trefoil pattern and holds lots of Girl Scout Cookies, toys, sports gear and more. It includes a removable cookie stand to display your inventory, along with a chalkboard and a clipboard. SRP: $129.99. 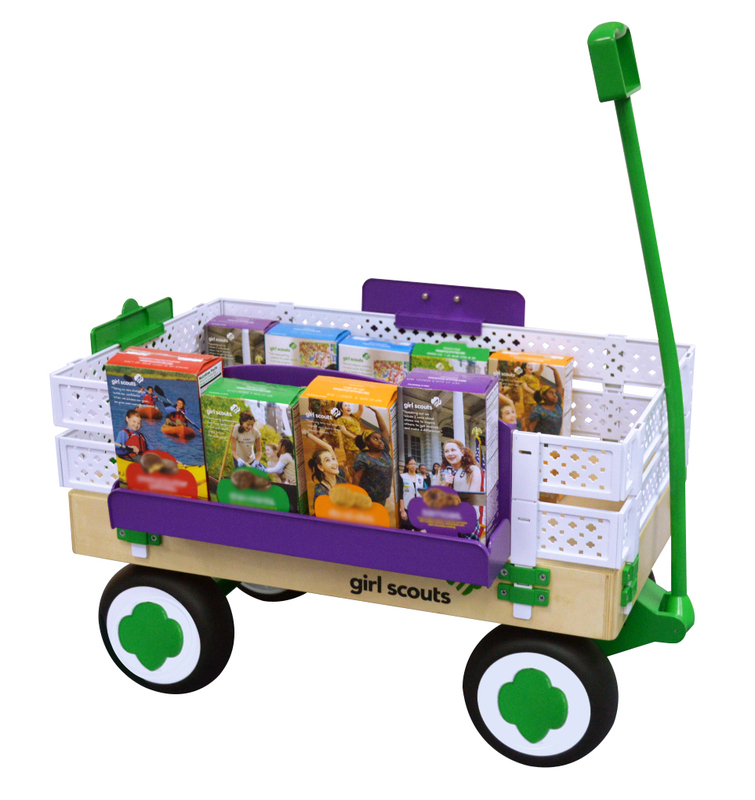 Girl Scout Cookie Stand – This classic wooden cookie stand provides hours of engaging playtime and conveniently folds up and fits into its carrying case so that girls can easily set up shop and sell their delicious cookies anywhere they go! It includes cardboard printed “play” cookie boxes, chalkboards, chalk, an eraser, pins to “bling your booth” by adding signs or fun decorations, and fabric shelves to beautifully display cookies on top of and below the stand. SRP: $79.99. We’re the preeminent leadership development organization for girls. It began over 100 years ago, with one woman, Girl Scouts’ founder Juliette Gordon “Daisy” Low, who believed in the power of every girl. Juliette organized the first Girl Scout troop on March 12, 1912, in Savannah, Georgia, and every year since, we’ve made her vision a reality, helping girls discover their strengths, passions, and talents. Today, as yesterday, Girl Scouts builds girls of courage, confidence, and character, who make the world a better place. And with programs for girls from coast to coast and across the globe, Girl Scouts offers every girl a chance to do something amazing. To volunteer, reconnect, donate, or join, visit www.girlscouts.org. check out the amazing gallery from Wicked Cool Toys.